There's something about a tom turkey all puffed-up and shiny on a glorious spring morning that makes him seem bigger than life. Turkey hunters love to tell stories of the toms they have shot and the ones that got away. Some of these stories lead to myths that we've heard and shared so often, we take them as gospel. Here's a look at four popular myths about spring turkey hunting and a thought or two about how you can turn myth into method. Foxes and coyotes are clever. Deer are cagey at best. Turkeys, for all the hype that has been written about them and all the lore that turkey pros preach, are dumb as rocks. With a brain the size of a cherry, there is not a lot of room inside a turkey cranium for thought. What turkeys are, however, is wary. Turkeys are under attack by predators from the moment they pop out of the egg. Owls, hawks and all manner of mammalian predators eat young turkeys. Even adult turkeys fall prey to coyotes and bobcats. A turkey's senses are acute. They can see and hear as well as or better than a deer. It's been said that if they could smell, we'd never kill one. Turkeys spend every waking moment watching out for trouble. If something doesn't look quite right to a tom, he will just walk the other way. Many a turkey has picked out a hunter who thought the bird was looking in a different direction. With their eyes mounted on the sides of their head, they can see just fine out of one eye. When a tom's beak is pointed at a 90º angle from you, he's looking right at you! You don't have to outsmart a tom - you simply have to avoid being seen or heard for what you are. If you can sit tight when you need to and make only the sounds of a hen, you'll kill your share of longbeards. You can't move on a turkey? Every turkey hunter has had a bird show up when his gun is out of position. Try to swing around for a shot, and the bird invariably flies or runs before you can draw a bead on him. There are two situations where you can usually get away with moving, if your timing is right. If a tom is strutting in front of you with his head tucked and his tail fanned, wait until he turns his back to you. When you can't see his head, he can't see you. At that moment, move your gun into position and wait for him to come out of his strut. A sharp cluck or cutt will usually make him do it. When his head comes up, shoot. This trick works even when several birds come in together. When one is displaying with his back to you, you have about three seconds to make your move. The others will see you and start putting and moving away, but the displaying tom will usually come out of his strut and lift his head to see what the commotion is about. If a lone tom comes in, but doesn't turn his back to you, you can sometimes get your gun up if you move at glacier speed. With your eyes on the bird, try to keep all your movement directly in front of you. If he is not alarmed, he will often stand right there while you lift your gun ever so s-l-o-w-l-y. Move too fast and he'll bust you. Move slowly enough so he doesn't notice, and you should get an easy shot. Adriana Fischer, of Saukville, shot this big tom during a Learn-to-Hunt event in 2006 in Ozaukee County with the help of her brother, Jesse. Photo by Ted Fischer. Gobblers develop a pecking order, and every tom knows where he stands in relation to his fellows, but this hierarchy is less important to you than it is to the birds. If you choose a good location and call like a hen, you should get a tom to respond and give you a crack at him. Do you care if you shoot the boss tom or a bird lower on the totem pole? I sure don't. Besides, the biggest tom with the longest beard and spurs is not always the boss. The boss hen is the bird to watch for. She is the one that sasses the other hens, the one the others listen to, and the one all the other birds follow. The wariest of all turkeys, she will lead the tom you hope to kill away from your set-up. When you encounter a tom with one or more hens, one of those hens is usually more vocal than the rest. That's the boss hen. You can sometimes call her in by imitating her every call. When she yelps, you yelp. When she cutts, cutt back at her. You may get her worked up enough that she comes in to show the upstart hen who's boss. If that happens, the tom will almost always follow her right to you. Spook a tom and it's over? We've all been busted by a bird that came in silently, one we stumbled on when we got up to move, or one we were trying to get closer to before trying to call him. A spooked bird will run or fly off, but he won't leave the township. Chances are he will go only far enough to feel he has safely eluded whatever it was that spooked him. He knows his territory and will not leave it for good. Several years ago on the first day of a Learn-to-Hunt program in Ozaukee County, Jesse Fischer called in a big tom for his sister, Adriana, who got off a poor shot and wounded the bird in the foot. The next day, hunting in the same woodlot, Jesse called in that same tom. This time, Adriana killed him. 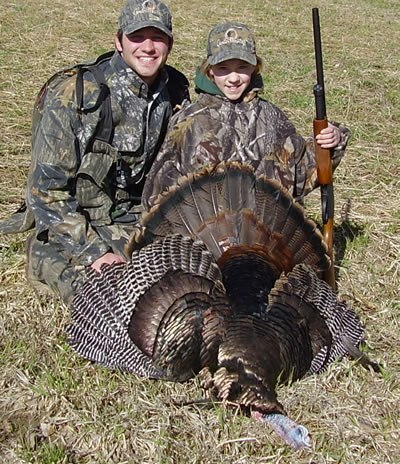 The bird was a little more hesitant the second day, but Jesse was still able to call him close enough for his sister to kill him cleanly with a 20-gauge. OK, so Jesse is a former state turkey-calling champion, but my point is that even with a few pellets in his foot, this bird was still in the same woods the next day and still looking for hens. Another time, two friends were hunting the bluff country along the Mississippi River. They heard a tom gobbling from his apparent strut zone atop a bluff and tried to sneak close enough to work him. They spooked the tom off the bluff, so they decided to give him up. Before they got back to their truck, however, they heard him gobbling once again from the same spot. They could tell it was the same bird because he had the same long, high-pitched gobble. It was close to quitting time that day, so they did not try for him again, but they learned a valuable lesson. Had they moved right to the bird's strut zone after spooking him off, they might have been able to kill him when he came back. Some hunters actually use that strategy of running a bird off his strut zone, then setting up and calling him back to it. It's similar to the fall strategy of scattering a flock of young birds, then calling them back together. These methods may not work every time, but you only need one trick to work once to make your hunt successful. Let me know if you are able to turn a myth into a method this spring. Dan Small is host/producer of Outdoor Wisconsin on Public Television and Outdoors Radio. He is also contributing editor of Wisconsin Outdoor News. He has written several thousand articles for national, regional and state-based outdoor publications since 1972. Listen to his syndicated weekly radio show on stations throughout Wisconsin and here on Lake-Link. For more information visit www.dansmalloutdoors.com.